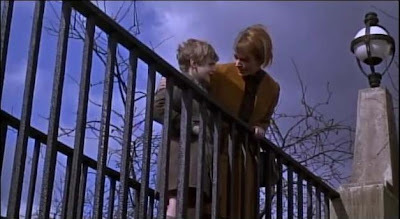 One of the most indelible images of cinematic science fiction, a vision of an insidious transmogrification of government, came to us via the late Ray Bradbury’s “Fahrenheit 451”: A young boy with his mother looks down from an overpass as racing fire trucks speed by, sirens sounding, an eerie blue gumball beacon flashing and says: “Oh, mummy, look! Firemen. Mummy, there's going to be a fire.” In Bradbury’s future, firemen no longer “put out fires” instead they burn books. Bradbury’s nightmare future involved an Orwellian-style totalitarian, authoritarian government controlling and limiting its populace’s thinking by scrupulously denying them access to books. The future that is arriving is almost the reverse: Instead of a government with intrusively-great power, the reality that is arriving is governments shrunken down to dependent weakness. This is more like the nightmare dystopia envisioned in the science fiction film “Robocop,” where a shrunken, debilitated government is so small and bankrupt that it is unable to resist a privatizing sell-off of its central functions to huge unaccountable corporations; even the police department is administrated by a private corporation (paving the way- spoiler alert!- for that corporation to be the film’s villain maneuvering for a land grab). In “Fahrenheit 451” the government deprives the public of books intending that the public have an illiterate lack of perspective about what is going on in the world, the activities of the government included. In a different way, plastering fire trucks with cooperate advertisements involves a similar dumbing down of the public’s understanding of the role of government, particularly the government’s appropriate and proper interrelationship with private enterprise. It implies that government exists almost by the cooperate sector’s grace or as a sideline to it and that, as in the Robocop dystopia, it can be appropriate for government to put its core functions up for sale to the highest bidder. A cavalier attitude about government selling out to business entails consequences. 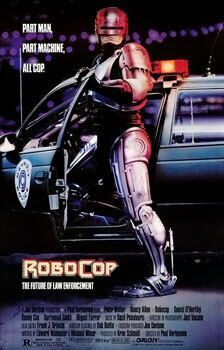 In recent Noticing New York coverage I wrote about Jane Jacobs’ warning in her “Systems of Survival: A Dialogue on the Moral Foundations of Commerce and Politics;” (1992) that the inappropriate mixing of government and business tends to result in a degradation of fundamental moral systems and principles (much as is depicted in the film Robocop). With such intermixtures, government officials reorienting themselves to serve business interests are prone to forget that they are supposed to perform an essential guardian role protecting the public interest first, foremost, and above all else. In “Fahrenheit 451” the squelching of free speech that deadens the public’s critical thought process is heavy-handed and obvious and performed directly by the government. What’s happening in the future of today's world is that the sound of meaningful free speech in this world is being snuffed out by its inability to compete with the amplified cacophony of commercial “speech-on-steroids.” For more about this and also how speech is becoming increasingly commercially privatized through copyright, media ownership, property ownership and other laws favoring corporations see: Saturday, October 22, 2011, Occupy Wall Street and the Banks- Messages From Bonnie & Clyde, “They’ve Got Too Much Money”: Ownership of the Public Forum by the Wealthy? When cooperate logos are slapped-on on government vehicles one might infer that what the government does is inherently less important than the private sector. Really now! . . .
. . . There is a reason that fire trucks are painted red: Not because that is the color of fire but to make an urgent, immediate claim on the public’s attention, also with sirens and flashing lights, so that the fire truck can pass through traffic, people pulling over to the side to make way for the a mission of rescue more important than everyone else's everyday commute or trip to the store. (The Times article mentions corporate logos could similarly wind up on Onondaga County Rescue helicopters.) What absurd redefined message does it send that a fire truck’s first claim on the attention of a surrounding sea of traffic will now be to urge people to eat at a particular fast food chain? It consigns the actual purpose of the fire truck to a second class tier. Presumably, no business or enterprise would choose to advertize on fire trucks if the public perception was that the fire department was doing a poor job. But if the fire department is doing a good job why shouldn’t the information and logos appearing on the trucks be exclusively about that department as a way to advertise for the raising and allotment of tax dollars? The implication is also that crucial public services are being delivered only because the fast food chain is stepping in to finance them. That’s hardly the case. As the Times hints, what the advertising could bring in would be paltry compared to the overall cost of running a fire department. The Baltimore City Fire Department is comprised of stations that “house about 100 firefighting, emergency medical and special operations companies.” Advertising is not expected to bring in enough to keep even one company open. (Closing one fire company would save Baltimore a little over $2 million a year. - The article reports that closing three would save on the order of $6 million a year.) In other words, despite the handing out of a misleading advertising credit the taxpayers are paying for probably around 99 and 44/100ths of the cost of that municipal department, which is pretty much the whole ball of wax. But why should we expect scrawny, drowned-rat government to effectively negotiate deals that are fair to the public? Part of the reason governments are willing to consider such desperate plans (and able to make any sort of credible case when presenting them to public) is because they are so hard up for money and that is because, going back to the late 1970s, there has been a concerted effort by conservatives to “starve the beast” (i.e. the government, with tax cuts and the creation of government deficits), the goal being, in the words of conservative activist Grover Norquist, to get the government “down to the size where we can drown it in the bathtub.” Hence, the image of a drowned-rat government pleading for table-scrap income from fast food advertising. For more about the intentional creation of deficits so that, “Spending cuts could then be sold as a necessity rather than a choice, the only way to eliminate an unsustainable budget deficit”, See Paul Krugman’s column: The Bankruptcy Boys, February 21, 2010. If the starving of the beast hasn’t yet got local government down to the size where those governments can be drowned in a bath tub they are at least down to the size where they can be lassoed, roped, and branded like calves at a rodeo. Do Those Besieging Government Want Small Government Or Compliant Government? Paul Krugman has pointed out that Republican apostles of small government are not necessarily sincere. New Jersey’s Governor Chris Christie and presidential candidate Mitt Romney are included in his list. He calls them “fake deficit hawks.” See: Big Fiscal Phonies, May 27, 2012.
for all their alleged deep concern over budget gaps, that concern isn’t sufficient to induce them to give up anything — anything at all — that they and their financial backers want. I myself believe that government needs to be at least big enough to perform its guardianship function of taking on the big corporations and monopolies, but when government is big you can wind up getting the worst of both worlds. That happens when government neglects its guardianship function and big business and big government collude in big-time crony capitalism. That is the kind of corporatist conduct that everyone, including both the Tea Party and Occupy Wall Street ought to agree to abhor, see: Monday, October 4, 2011, On NPR, Echo of Coinciding Principles Noticed: What the Tea Party and Occupy Wall Street Ought To Agree On. Mentioning that transit systems across the nation have recently been aggressive in trying to sell the naming rights of stations, the Times article covers the fact that in “Brooklyn, new signs went up last month at the Atlantic Avenue subway stop bearing a sponsored addition to its name: Barclays Center.” (See the Times provided picture on the side.) Accordingly, the Times, as it should, actually included an appropriate mention of Atlantic Yards in what it was seemingly reporting as a negative trend, something it often neglects to do. The article stated that the Metropolitan Transportation Authority is being paid for the naming of the station, but didn not point out that the payment being received is exceedingly miniscule in relation to the benefit being conferred upon Barclays. It was decided upon by the MTA with very little thought or negotiation in terms of benefitting the public. 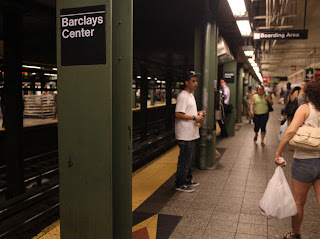 (See: Sunday, June 28, 2009, Naming a Problem: The MTA Gives Ratner the Right to Name Brooklyn Subway Stations “Barclays”). The Times reports the amount paid as “$4 million over 20 years”: The MTA board (as described in the staff summary it got) approved “$200,000 per year”. . . Think how little that means in terms of the present value being paid! This is not drowned-rat government lacking the skill to negotiate a credible deal– The MTA is a big, sophisticated government organization with appreciable resources– This is instead big-time crony capitalism. It is an example of what Jane Jacobs warned happens when, in pursuing “private/public partnerships,” government officials mix government functions up with the pursuit of business: The government officials stray from their guardianship responsibilities and fail to protect the public. In the case of Atlantic Yards, however, those government officials strayed from and neglected their true responsibilities far earlier; it all began with the abuse of eminent domain with the goal of benefitting a private developer at the expense of the public. What's In An Advertised Name: By Any Other Other Name Wouldn't "Barclays" Smell. . . ? Think about the appropriateness of naming New York City subway stops “Barclays Center” (while receiving virtually nothing of value to do so). “Barclays,” nothing but a name being advertised, is simply one more name in a sea of distracting ads. The “Barclays” bank didn’t build the arena that advertises its name; it’s being built by Bruce Ratner with the financial assistance of a Russian oligarch, Mikhail Prokhorov. The bank contributed nothing to the city or the borough of Brooklyn in order to build it. It has nothing to do with the arena. “Barclays” is not the name of the name of the basketball team planning to play there. It is not even necessarily the name of an honorable bank. Just of now the bank has been fined £290m ($450m) for manipulating LIBOR rates to benefit its traders and cook its books. Chief executive Bob Diamond is under pressure from British politicians to quit over the rate rigging scandal. Perhaps the bank can certainly use the advertising at this time given its bad acts, but the public finds itself much in the same position as when, in the middle of the fiscal crisis, the new Mets “Shady Stadium” found itself opening with the name "Citifield," after an apparently failing bank. Barclays was also deeply involved in various scandals throughout the fiscal crisis. Citibank survived 2008 but was just downgraded by Moody’s. The message from the Moody’s downgrade of Citi and several other banks is that the banking system isn’t more sound than in 2008. How long will any of these banks be around and by what names? Remember Chemical Bank? Manufacturers? One day it may cause substantial confusion when “Barclays” isn’t around either. Perhaps the most recent scandal will take its toll. Perhaps the Euro crisis will. Maybe, given the scandal, Barclays will have to rebrand with a new name or merge into a bank with another name. It may go bankrupt. The AOL Time Warner Center is no longer the AOL Time Warner Center, but for a building that is just a corporate headquarters, to endure a name change is of far less consequence than for the names of two subway stops to change in a subway system that is obscure and complicated enough to understand already. When the Barclays name fades away there will be no residual sense of history associated with its passing because it was, after all, just an advertisement for something that had no association with its place or moment in time. There was no reason for government to confer upon it the very special honor of making it a place name in the city. 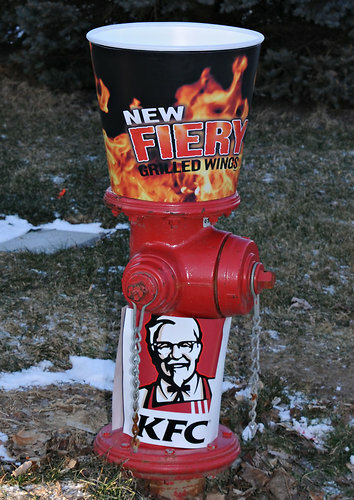 It makes no more sense to name subway stations “Barclays” than to put KFC logos on Baltimore fire trucks.